I was supposed to be on a flight to New Jersey this morning for a Colgate sponsored Social Media Conference scheduled for tomorrow. But, unfortunately, family medical problems have left me staying home. I hope I have the opportunity to attend in the future. 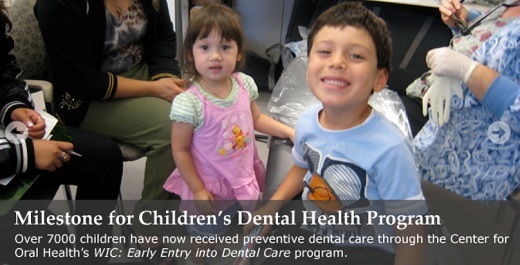 After providing preventive dental care to more than 7,000 low-income children in Los Angeles for the past few years, the Center for Oral Health's WIC Dental Collaborative Project will end in June when funding runs out. The L.A. WIC project was initially funded by Kaiser Permanente and the U.S. Health Resources and Services Administration. It was originally intended to operate for only two years and would have end in December, but recently received a six-month extension from the First 5 Commission of Los Angeles, a children's advocacy group. "This program is one of the most successful prevention strategies at a time when we can really help prevent early childhood caries at a very early stage, before they're really rampant in the mouth of 3- or 4-year-olds," Francisco Ramos-Gomez, DDS, MPH, professor of pediatric dentistry at the University of California, Los Angeles (UCLA) School of Dentistry, told DrBicuspid.com. The children received a risk assessment, toothbrush prophy, examination, and fluoride varnish application, while the parents received nutritional guidance for parents, with emphasis on avoiding sweets and not putting youngsters to bed with bottles of milk or juice. "We tell them the last thing that touches their baby's teeth at night should be fluoridated toothpaste," Dr. Ramos-Gomez said. "They keep saying they brush their child's teeth three times a day, but they don't say that after they brush their teeth they give them ice cream, a Snickers bar, or a bottle." When he hired me, Hal Christensen said he needed a writer to describe the American Dental Association’s activities in the nation’s capital, of which he was the greater part as I was to learn, and that I must leave deadline-a-minute journalism and report to the ADA Washington Office May 1, 1978. He didn’t tell me I’d have to put up with his cornball humor, his Monday morning off-key “Hail to the Redskins, hail victory” bluster, which might or might not describe his beloved football team’s recent performance, which he no doubt witnessed as a season ticket holder unless he had offered you his seat on a given Sunday, or his “George Washington Bridge” doggerel doggedly babbled to “Sesame Street” sing-along diction if not tone when mood struck and audience presented. Though he may have lacked the finesse of a modern-day BlackBerry lobbyist, Hal defined the ADA in Washington with canny corridor smarts in the lobbying of lawmakers during some 28 years of unprecedented expansion of government health care activity during the 1960s and ‘70s. “In short, he has been dentistry in Washington, and this profession is the better for it,” said Thomas J. Ginley, Ph.D., Association executive director when Hal retired in 1985. Hal Merrill Christensen, born Jan. 31, 1926, in Richfield, Utah, passed away April 18, 2012, in Bountiful, Utah. For 40 years, including his 1957-1985 ADA Washington Office years, he and his family lived in nearby Chevy Chase, Md. Their roots were in Beaver, Utah, and Hal and his wife, Mary, would return to Beaver in 2002. A Cedartown dentist was arrested Saturday on warrants out of Floyd County. Gerald David Palatini, 55, was arrested by Polk County deputies and released to Floyd County deputies on a warrant charging him with felony false statements and writings. The charges are a result of untruthful answers given by Palatini when he filled out a U.S. Department of Justice firearms transaction record. Palatini answered "no" to a question regarding whether or not he was under indictment for a felony. Palatini was charged with five counts of sexual exploitation of children. The charges against Palatini were brought forth in April of 2009 when he was arrested by GBI agents as a result of an investigation of the Georgia Internet Crimes against Children Task Force. Palatini has practiced dentistry in Cedartown since 1994 and was given special recognition in 2003 for his contribution to the families of Polk and surrounding counties by accepting Peach Care for kids, a health insurance program administered by the state and designed for working families that do not have access to health insurance. Police say a Long Island man with a sixth-grade education and no formal medical training has been charged with practicing dentistry without a license. Manuel Carranza of New Cassel pleaded not guilty at his arraignment Thursday. Bail was set at $2,500. He was represented by Legal Aid, which does not comment on pending cases. Nassau County Police say Carranza operated the practice for a year and a half out of his home. They say he used a multilevel mechanics drawer for his dental instruments and had no equipment to sterilize them. Police said the cash-only business provided fillings for $20 to $30 and root canals for $50. Lt. Ray Cote added that a sign offered free extractions if the fillings or root canals did not ease a patient’s suffering.